Mmm-hmmmm. I know. To good to be true? I would agree if I hadn't eaten 2 slices myself. But, as per usual, there is a story here. This didn't turn out to be what I planned for it to be. So, I confessed on my Facebook page that I love those little chocolate bundt cakes from Kentucky Fried Chicken. So sue me. It has been my personal mission to recreate those little rings of love from the beginning. I have tried a few things but, this time....THIS time, was going to be, THE time. Well I am not to proud to admit it wasn't THE time, but this time, it came out so delish, I had to share it anyway. I have figured a few things out about those little rings of love. They are frozen, that alone keeps them super moist, so if you want to make this cake ahead, and freeze it for a few days or a week before you ice and serve it, you might get a closer result. I was not going to give you a cake that you had to freeze for a week, but if you DID do that, uh-huh, might be your ticket to greatness. When I originally made this with just a regular from scratch chocolate cake recipe, it didn't do so well. A bit like falling apart brownies, no bueno. So I knew this time I wanted to use a pound cake base. Well, it turned out lovely, and seriously, if the "triple" doesn't reel you in on the chocolate factor, maybe the sour cream will. Here we go! You want ALL of your ingredients at room temperature, even the sour cream. Do this by leaving everything on the counter for at least 30 minutes prior to baking! There are a few ingredients near the end, I will make all ingredients RED! Preheat your oven to 325 degrees F, and spray a bundt pan with nonstick cooking spray. In the bowl of your mixer, or any large bowl if mixing with an electric mixer, add in your butter Beat until creamy and smooth, and it has lightened a bit in color. Add in sugar and continue to beat until sugar and butter are light and fluffy. Add in your eggs, one at a time, beat it in before adding the next. Next you will add in your vanilla and mix until fully incorporated. In another bowl combine, your flour, cocoa powder, baking powder, baking soda, and instant chocolate pudding mix together. Just give it a quick mix to combine it. Now alternately add in some of the flour mixture to your butter and egg mixture, and then add some sour cream. Alternate until all ingredients are combined and your batter is smooth and creamy. 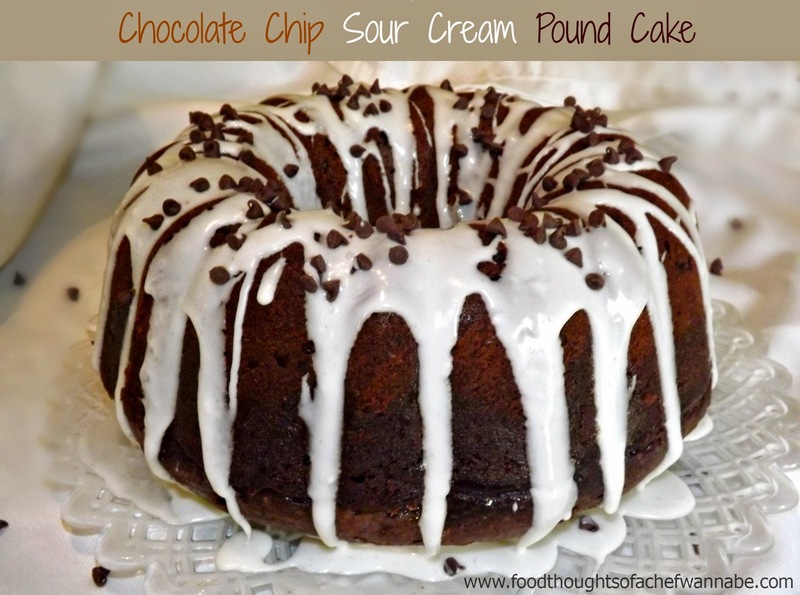 Fold in chocolate chips and pour into your bundt pan. This will fill it nearly to the top. No worries, it won't rise a ton, and even at that, it won't overflow. It might make you nervous, but no worries, I got your back on this. Trust me. Now bake for 90 minutes. Yes, I said it, 90 minutes. Start checking at the 70 minute point, and when a toothpick comes out clean it is done. Remove from the oven and let cool for 10 minutes. Mix these together and set aside. Poke holes in your cake, while still in the pan. Make them go all the way through just don't go quite all the way through. Make these wholes all over. I used a chopstick. Now SLOWLY pour the milk mixture over the cake. Go slow or don't call me to clean up the sticky mess! When you are done, let sit until completely cooled and the milk is completely absorbed. Run a knife around the inside hole and the outside, and flip out on to a plate. If I were going to freeze it, this would be the point where I would wrap it tightly in saran wrap, and then foil and place in the freezer, otherwise, move on! Combine all ingredients. Make sure it is a loose enough mixture to drip down the sides of the cake and go for it. Drizzle it, spoon it, do whatever you feel is necessary to get that icing on that cake! Garnish with some mini chocolate chips if you like! Enjoy this rich chocolate goodness! I have to admit, I still put some whipped cream on top because, well, everything is just better with it.